Welcome to RC’s newest category “Development Hell” where bad photoshopping meets our ideas for movies that will never be made. 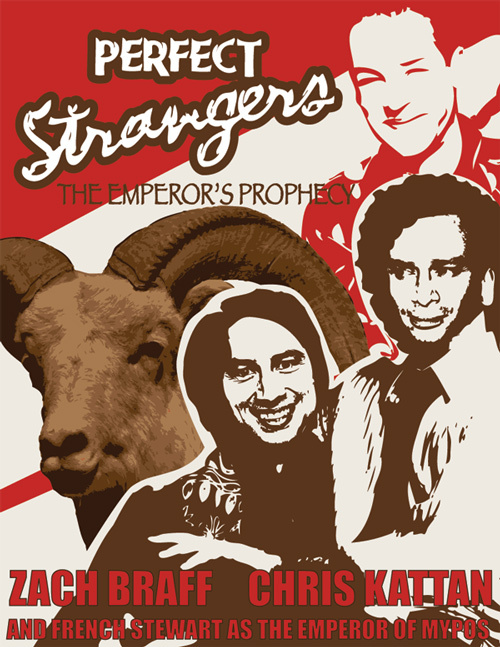 We begin with the Perfect Strangers film, starring Zach Braff and Christ Kattan (after Giovanni Ribisi drops out) as the oddball roomies. Mike and Jim are to thank/blame for much of the concept: French Stewart, Emperor of Mypos receives a prophecy via a goat kicking someone in the balls. The message is clear – Balki is to become Emperor! Stewart, drowning in Coming to America rip off jokes, comes to Chicago to stop the prophecy from coming true but not if these Perfect Strangers can help it. Yes, this is now how I spend my early Wednesday mornings.